Patrick’s Well on Croghan Hill – The original Clebach? 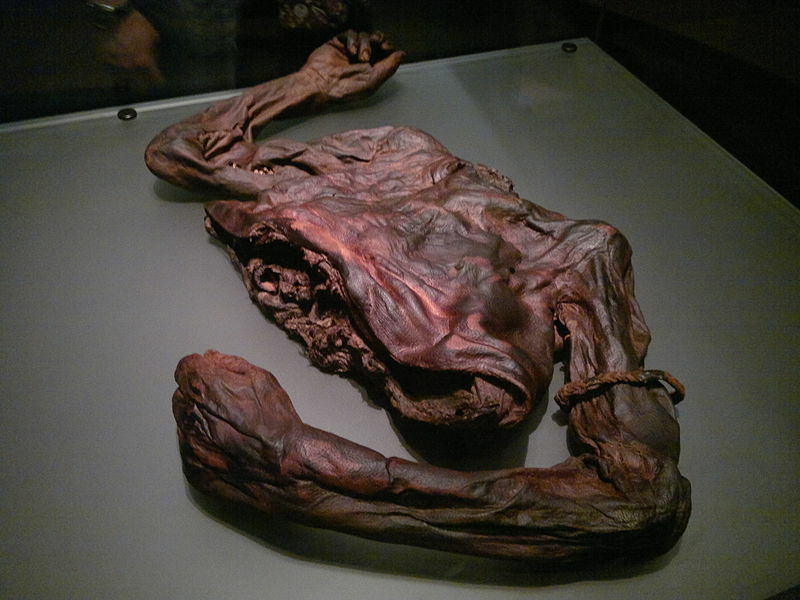 ‘Old Croghan Man’ – A possibly self-sacrificial bog body from near Croghan Hill. ‘The Boyhood Deeds of Fionn’ state that the fairy woman of Cruachan Bri Eile took the life of a man from the parties that went to her at Samhain… Either she or the Bord na Móna certainly appear to have been fierce to him! Sinend daughter of Lodan Lucharglan son of Ler, out of Tír Tairngire (“Land of Promise, Fairyland”) went to Connla’s Well which is under the sea, to behold it. That is a well at which are the hazels and inspirations (?) of wisdom, that is, the hazels of the science of poetry, and in the same hour their fruit, and their blossom and their foliage break forth, and these fall on the well in the same shower, which raises on the water a royal surge of purple. Then the salmon chew the fruit, and the juice of the nuts is apparent on their purple bellies. And seven streams of wisdom spring forth and turn there again. Now Sinend went to seek the inspiration, for she wanted nothing save only wisdom. She went with the stream till she reached Linn Mná Feile “the Pool of the Modest Woman”, that is, Brí Ele — and she went ahead on her journey, but the well left its place, and she followed it to the banks of the river Tarr-cáin “Fair-back”. After this it overwhelmed her, so that her back (tarr) went upwards, and when she had come to the land on this side (of the Shannon) she tasted death. Whence Sinann and Linn Mná Féile and Tarr-cain. if that be the true tale to tell. This suggests that, in conjunction with the other legends, Sinand and Eile and even Bridget might be one and the same, and we might also interpret ‘Feile’ to be a literary fixation of the indigenous local tribal name ‘Failghe‘. Add local traditions about Aine into the mix and things certainly get more interesting! Are these all the same? 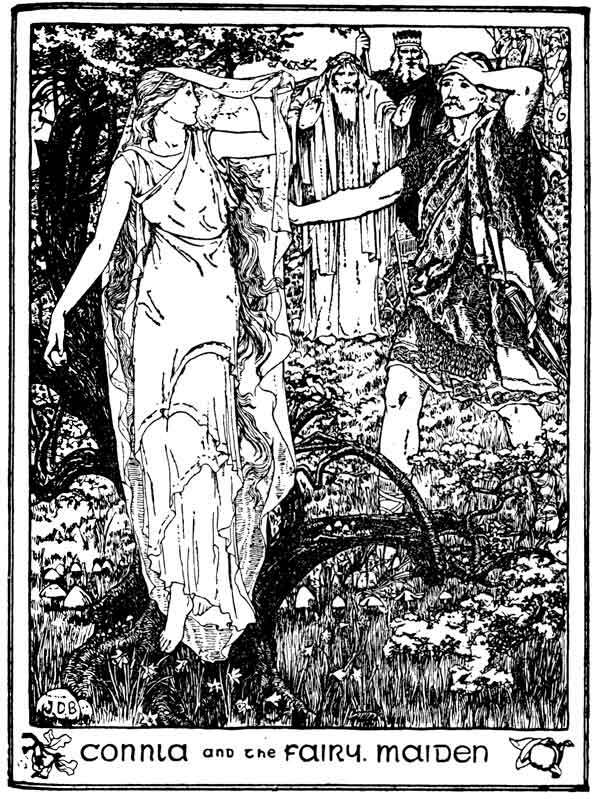 In the Ulster Cycle tales, ‘Eile’ was the ‘other’ daughter of legendary High King Eochaid Feidlech, whose more famous offspring was the fairy Queen Medb of Connaught, who features prominently in the Táin Bó Cúailnge. Medb was associated with another Cruachan – Rathcroghan in Roscommon – which has similar pagan connotations. Both Cruachans were the site of significant pre-Christian cemeteries, making their connection with the Otherworld strong. 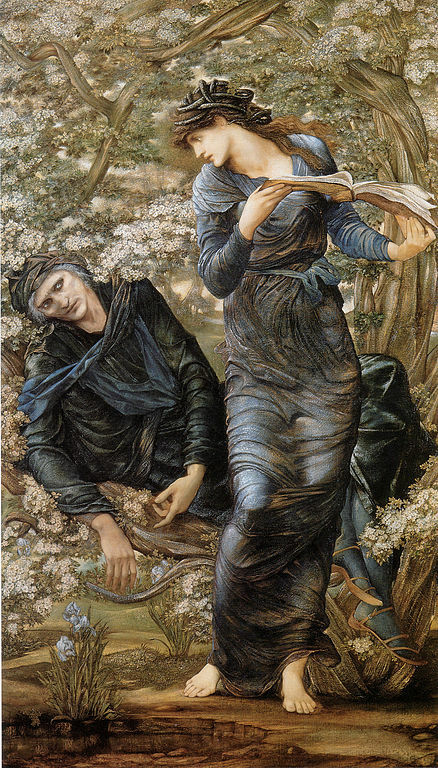 Examining the etymology of ‘Eile’ and ‘Allen’ and considering the association with beautiful fairy women and St Bridget, it is fairly obvious that the derivation in álainn – ‘beautiful’. This makes ‘Cruachan Bri Eile’ mean ‘Rock of the Beautiful Brighde’. Another place in the locality with goddess/fairy legends is ‘Cluain Aine’ (actual location uncertain), said by John O’Donovan in his edition of the ‘Four Masters’ to be near Croghan Hill. He translates ‘Cluain’ as ‘lawn, meadow or bog island’. Aine (‘Awnya’) is, of course, a name of the goddess encountered both in medieval legends and in placenames across Ireland. The hill and its environs was once the stronghold of the powerful ruling Ua Conchobhair Failghe (“O’Connor Faly”), the most significant sept of the Leinster Uí Failghe, from which tribe modern Offaly derives its name. This seat was at Daingean (Daingean Ua bhFáilghe – formerly Phillipstown) and was a regional capital until the start of the plantations and Flight of the Earls saw its importance decline. The former power of the historic native rulers is illustrated by annalistic references to the Battle of ‘Tochar Cruacháin Brí Eile’ between the English and the men of Ua Fáilghe, and which took place in 1385 (Source: Annals of the Four Masters). The O’Connor Fáilghe were victorious, destroying and routing the English contingent. 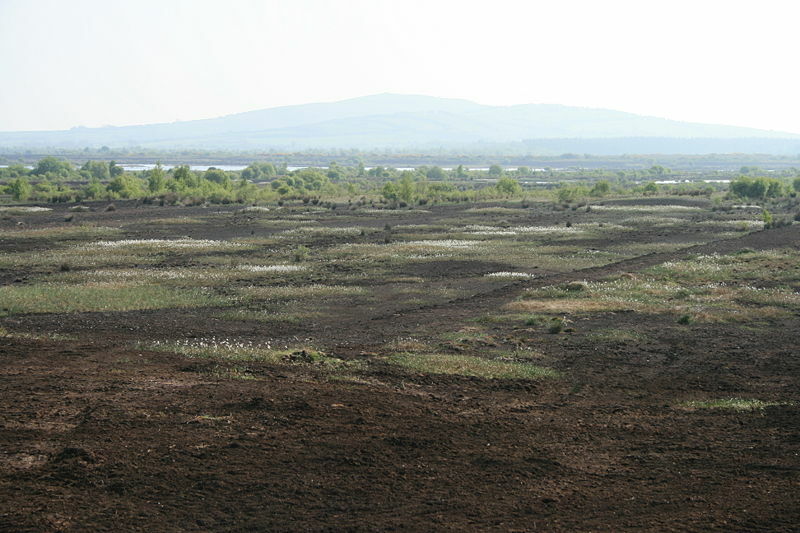 The name ‘Tochar’ (causeway) shows that there was an ancient bog trackway here (perhaps the one mentioned in Bethu Brighde), and it must have ‘come ashore’ at the hill or near O’Connor’s castle at Old Croghan village and connected outwards to other destinations. Cruachan Bri Eile was obviously once a powerful and strategic island fortress as well as a religious centre. Archaeological evidence of its importance goes back over thousands of years. ‘Teloch’ or ‘Tulach’ means a causeway – many used to criss-cross the boglands in ancient times and there was certainly one at Cruachan Bri Eile. Whatever place you believe the supposed ‘event’ may have happened (and it depends on the tribal loyalties of the writers), you can be certain that it occurred at some place associated with the goddess of the pagan past! The words Brig and Bri seem to link to St Bridget/Brighde, supposedly ‘given the veil’ at Cruachan Bri Eile by a saint whose name sounds suspiciously like a modified form of ‘Cailleach’, and who crops up later associated with the Isle of Man – the other ‘Hy Falga’. There was once a church dedicated to Bishop MacCaille (said to be a nephew of Patrick) on the slopes of Croghan Hill, the remains of which are still visible on the eastern slopes. The Calendar of Cashel noted that his festival was celebrated there on the 25th of April – somewhat close to Beltain just as the surrounding bog and its pools were being pierced by flowers and new summer growth! The same day was celebrated in the Isle of Man at St Maughold’s Well on an elevated headland over the sea. 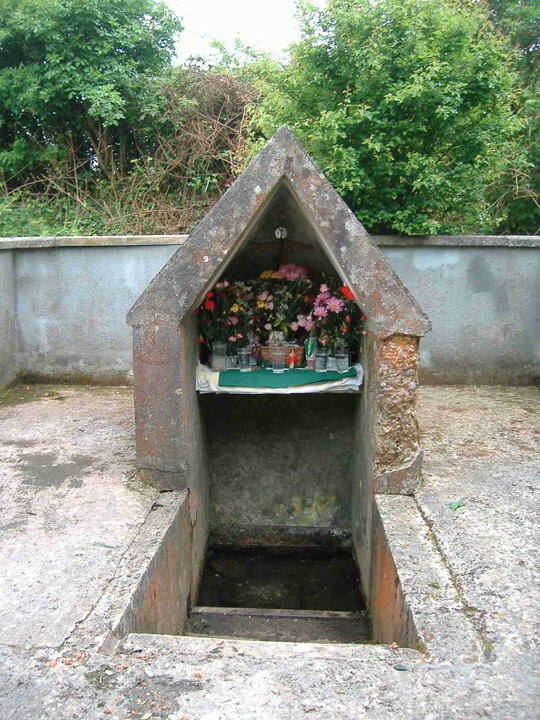 The well once emptied into a stone coffin-shaped structure in which the ‘saint’ was said to sleep (like Sinand in the Linn Mná Feile at Bri Eile) and Maire MacNeil commented on the Manx Lhunasa celebrations once held there. Other interesting placenames attached to the hill in the medieval Dindsenchas are Magh Dairbhreach and Druim Dairbhreach (‘Plain of the Oaks’ and ‘Ridge of the Oaks’), also on the east side of the hill.